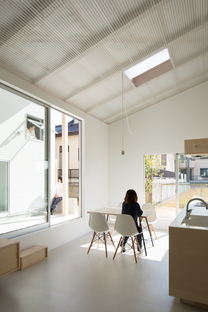 After the Rain Shelter House in Yanogo, y+M design office designed the Floating Roof House in Kobe, expressing the idea of landmark and private square. 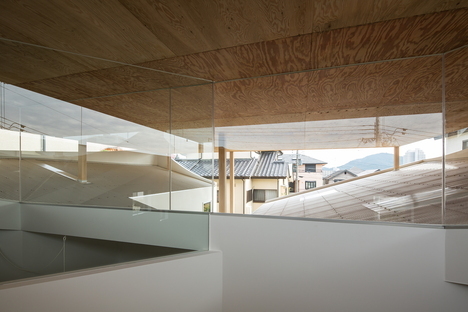 The Floating Roof House has a double roof that creates a gap to let in light and air. 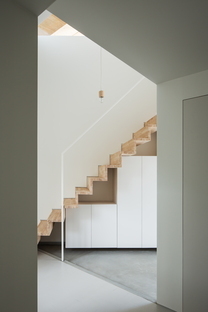 In the Floating Roof House in Kobe, Masahiro Miyake (y+M design office) returns to a theme that has attracted a lot of interest, the concept of the home as a small community, going beyond the anonymity of the urban façade and appearing as a place packed with meaning. 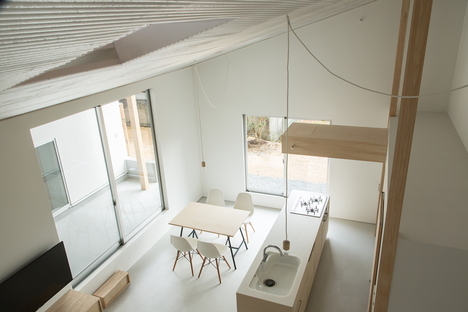 In this project, y+M design office goes back to the concepts expressed in the Rain Shelter House in Yanogo, Japan, where they formalised their architectural vocabulary, in simpler form. The house is defined as a personal place reflecting an identity which is differentiated from the urban landscape around it, which can be used as a reference point for orientation.Though a private building, it is also a landmark, enriching the experience of community living. 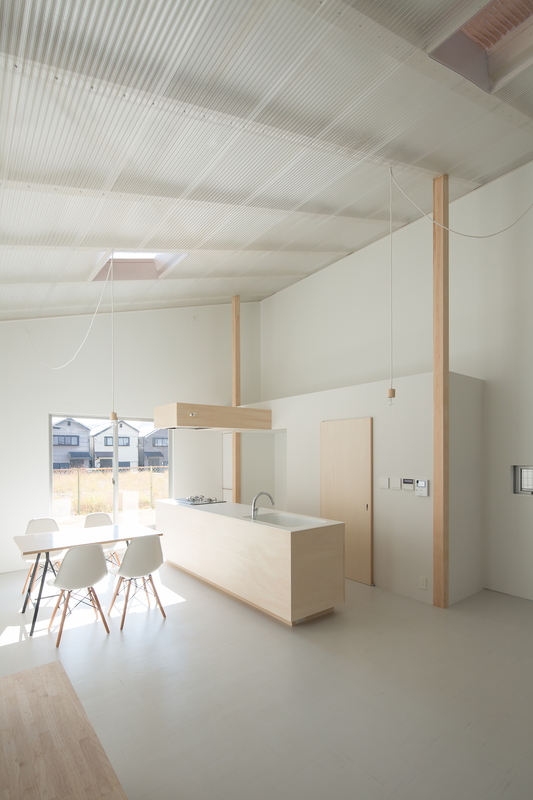 This vocabulary includes a floating roof perched on slender pillars which rises above the volume of the home, while the four walls below “grasp it” as if they were white curtains hanging from its four sides, to use the symbolism cited by Masahiro Miyake. As well as the second level roof, the one that effectively acts as infill, under which the home’s two levels are arranged, the ground floor containing the home’s main functions, for day and night use, and the first floor, between the gables of the roof, at different angles, containing the children’s play area and a big space for a variety of temporary uses. 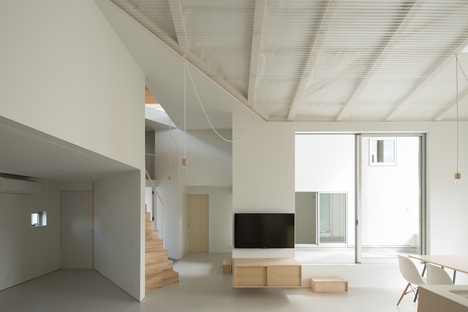 As if often the case in urban Japanese homes, the building is introspective and there are very few windows on three sides, as if contact with the world outside were defined through an indirect relationship with the light coming in from above, through the empty space formed by the two roofs. The south-facing windows dug into the main wall of the home actually also overlook the “interior” of the home, the pathway leading to it, facing one another to maintain the inhabitants’ privacy. 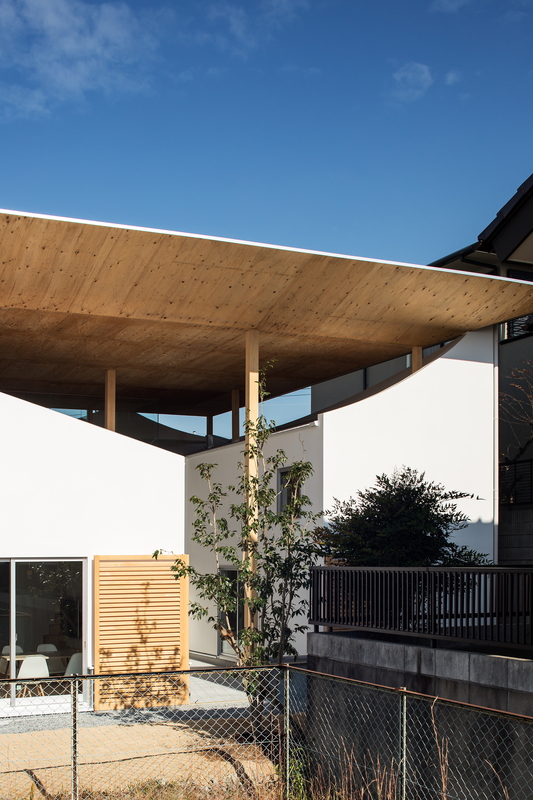 This combination of a roof detached from the walls and an entrance pathway not only forms a key element of the composition, but offers a solution promoting natural lighting and ventilation. 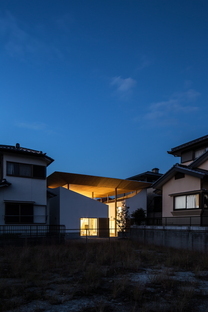 The sun’s strongest rays, from above, are screened by the big main roof, while the lower rays of the sun in winter penetrate the cut in the building created by the path, entering the spaces in the home overlooking it. 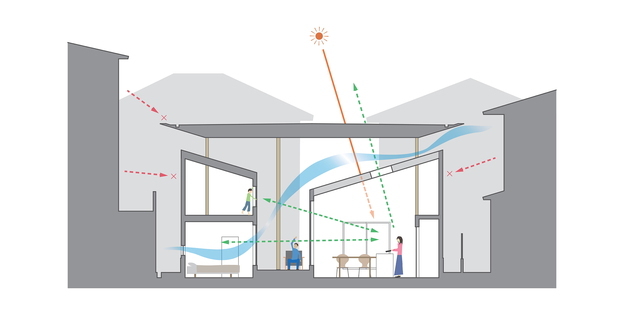 At the same time, air is channelled in this way and the gap between the two roofs forms several outlets for a beneficial exchange. 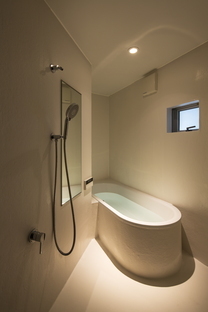 Inside the home, the spaces are oriented towards one another; the rooms are not isolated in their functions, but all contribute to creation of a central shared space, like a sort of private village square. This perception is reinforced by the indirect light from above. 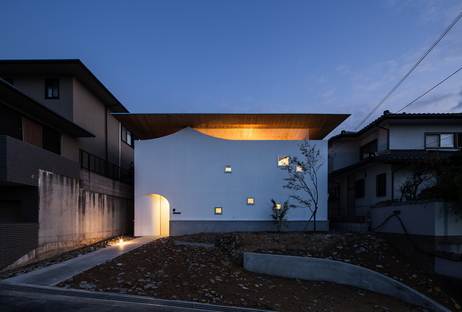 In the evening, the home is lit up from the inside, returning some of that light and making it look like a lantern in the city, reinforcing its status as a landmark.